It’s that time again, time for me to highlight an anti-woman wacko who made news this week. I read an op-ed in the New York Times earlier this week that was so full of chauvinism, cultural imperialism and xenophobia it made me sick to my stomach. Jean-Francois Cope is the president of a major French political party and the mayor of Meaux. During his career he was also the Minister of the Budget and the spokesperson for the French government. Cope is an influential leader in France but unfortunately he uses that influence to trample on the rights of Muslim women. Except that women who wear burqas do participate in economic and social life. Several months ago I took a crochet class from one of the local yarn stores. Two of my classmates were young girls, both wearing hair & face coverings. They participated like all the other members of the class, they were affable and funny young women and did not seem at all hindered by the fact that most of their face was covered. Women all over the world go to school, shop for groceries and contribute to society all while wearing veils. This face covering poses a serious safety problem at a time when security cameras play an important role in the protection of public order. An armed robbery recently committed in the Paris suburbs by criminals dressed in burqas provided an unfortunate confirmation of this fact. As a mayor, I cannot guarantee the protection of the residents for whom I am responsible if masked people are allowed to run about. The fallacy in this type of argument is astounding. Since one person wore a burqa to commit armed robbery it must follow that everyone wearing a burqa will commit armed robbery. The visibility of the face in the public sphere has always been a public safety requirement. It was so obvious that until now it did not need to be enshrined in law. But the increase in women wearing the niqab, like that of the ski mask favored by criminals, changes that. We must therefore adjust our law, without waiting for the phenomenon to spread. Yep, he just made the argument that women in niqabs might be criminals. I’m also really looking forward to the new legislation the French National Assembly will propose…banning the ski mask. 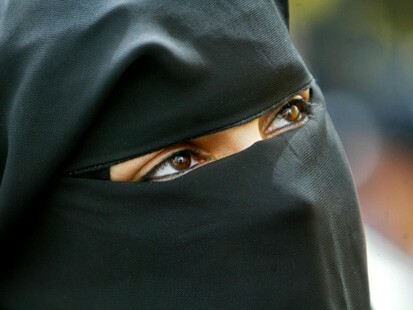 How can you establish a relationship with a person who, by hiding a smile or a glance — those universal signs of our common humanity — refuses to exist in the eyes of others?…But the niqab and burqa represent a refusal to exist as a person in the eyes of others. The person who wears one is no longer identifiable; she is a shadow among others, lacking individuality, avoiding responsibility. I really have no words for how wrong this is. A woman in a burqa has no humanity? Because this man cannot gaze upon her face she has no individuality and so she ceases to exist? Really? And I love that instead of acknowledging his own bias against this Muslim dress, instead of acknowledging his own failure in seeing the humanity in another human being when they wear a burqa or nijab, he instead blames the woman. Yes, this covered woman makes you see her as non-human. Yes, that makes sense. There are so many problematic things in this editorial. For example, saying that this isn’t religious discrimination. Because you know, so many non-Muslim French women are walking down the street in burqas. And then there’s the title, “Tearing Away the Veil”. I think really helps Cope in his assertion that this is a benevolent law that will uphold “the dignity of women.” As a woman, I can confirm that my dignity doesn’t at all suffer when men or laws tear pieces of my clothing off my body. One of Cope’s more cogent arguments is that “[i]ndividual liberty is vital, but individuals, like communities, must accept compromises that are indispensable to living together, in the name of certain principles that are essential to the common good.” I agree, part of peacefully living in society is compromising with our neighbors. But it is not compromise if one party is forced to give something up without receiving anything in return. So what will Muslim women be gaining in return for giving up their religious and cultural custom? It speaks volumes that Cope does not provide one way in which this law will benefit Muslim women. Rather, it proves that the health, happiness and rights of women were not the first priority in drafting this legislation. It is ironic that French leaders believe that the burqa ban will increase the visibility, responsibility and dignity of Muslim women. In reality, this ban will further push Muslim women to the margins of society. 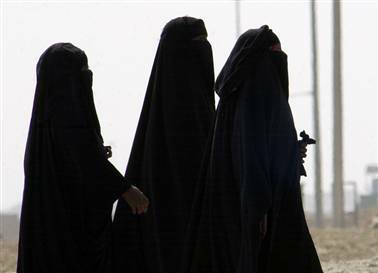 Yes, there will be some women who choose to take the burqa off but there will be just as many who are cloistered in their homes, unable to leave because of their religious and cultural beliefs. So what, exactly, is making these women invisible? I have to say at this point that I hate the idea of the burqa and nijab. I think they are horrible customs based on the oppression of women. That being said, it is not my right, or anybody else’s to dictate how another woman worships her god. The law that Jean-Francois Cope is proposing is just as repressive and misogynistic as the veil itself. Both the burqa and burqa ban are tools of patriarchal institutions, making women invisible and denying them the right to choose. We like to get up on our Western high-horse and proclaim our enlightened thinking, our commitment to equal rights for women. But oppression is oppression whether it comes in the form of clothing or laws that deny the right of women to control their own bodies. You know what else would make people more easily recognizable? No clothes.I, personally, am eagerly awaiting the banning of all clothes. No more hiding your unique tattoos, distinctive penises, or oddly-shaped birthmarks. National security requires it. Excellent piece, and AMEN to all of your arguments. Your arguments make sense, but I must admit that I am very uncomfortable seeing Muslim women in western countries wearing anything more covering than Hijab. Yesterday at the college where I teach, Mesa Community College, I saw for the first time a woman in Chador (I have taught many women in Hijab) and it made me sad, since to me it it conveys a tradition that is anti-woman, a cultural which values women as "less," at property of men and of their culture.